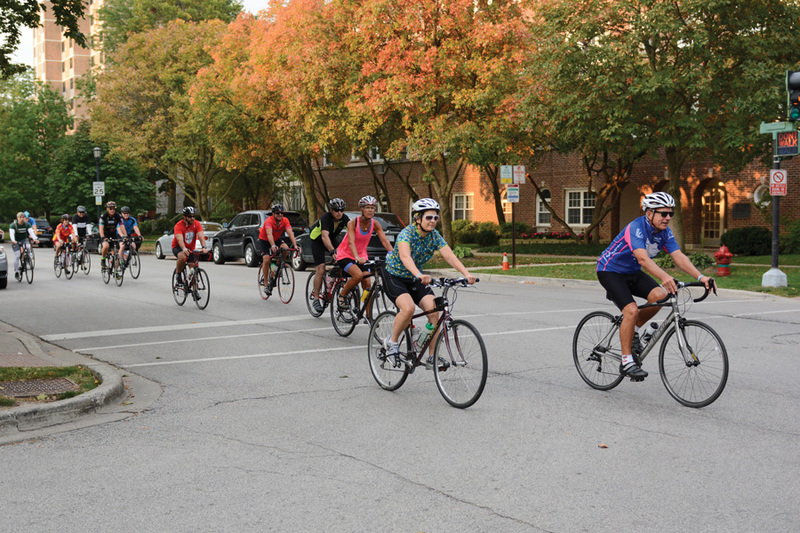 Cyclists ride through Evanston for Over the Rainbow’s 10th Annual Challenge Tour. OTR raised $150,000 at the Sunday event. A group of more than 100 people raised $150,000 riding their bikes along the North Shore on Sunday, participating in Over the Rainbow’s 10th Annual Challenge Tour to promote affordable and accessible housing. Over the Rainbow — a nonprofit that aims to provide housing, enrichment programming and services encouraging independent living for people with physical disabilities — will use the money raised from the tour to expand its resident services. The services “help with Medicare, Medicaid, food programs, enrichment programing and preventing isolation issues,” said Kaitlin Lavelle, Over the Rainbow’s manager of Individual Living. Riders, ranging from sponsors to the families of residents living in the organization’s housing, gathered at the Evanston Ecology Center on Sunday morning to ride between 25 and 100 miles, from the center to the highway in Northbrook. The nonprofit’s properties are financed by an affordable housing tax credit from Congress and feature assistive technology, including automatic door openers and kitchens requiring a limited range of motion, said Eric Cochrane, the organization’s executive director. Because Over the Rainbow does not use state money, it depends on fundraisers — such as Sunday’s bike ride — to cover living costs, Cochrane said. After the ride, participants returned to the center for an outdoor barbecue to meet with residents, family members and program directors. The sun was shining and groups of children played with puppies brought by Over the Rainbow board members. Valerie Nora, 56, who has cerebral palsy, has lived autonomously for nearly two decades because of Over the Rainbow. Lavelle said Nora has become an integral part of fundraising events in the accessible living community. On Sunday, Nora provided the cyclists — including her family members — with free post-ride snacks such as Clif Bars, chips and bagels. Nora said she loves Over the Rainbow because the organization gave her independence. Most residents at the nonprofit’s units are individuals who sought independent living and were taken out of assisted care, Cochrane said. Two of the affordable housing residents with physical disabilities participated in the ride itself, biking five miles each, said Annual Challenge Tour co-chair Tiffiny Higgins. “This is their first time on a bike this year, and they come out and enjoy the barbecue,” Higgins said. Over the Rainbow currently houses 300 residents in 10 buildings, said Annual Challenge Tour co-chair Sami Rahman. Within a week of opening applications for its newest property, Midtown Crossing Apartments in Des Plaines, Over the Rainbow had to close the back list because it had more than 200 applicants, Rahman said. The organization plans to build three more complexes in the next five years to address the high demand for its units, Cochrane said. Over the Rainbow will continue fundraising for its growing community to ensure the services it offers can keep up with the expansion of properties, Cochrane said.